One of the last projects filmmaker George Romero had been working on prior to passing away was the film Road of the Dead, a horror project that continued the legacy of his Night of the Living Dead franchise. While fans will still have to wait to learn about whether or not that project will ever come together, you can still check out Road of the Dead: Highway to Hell, on sale November 7th. 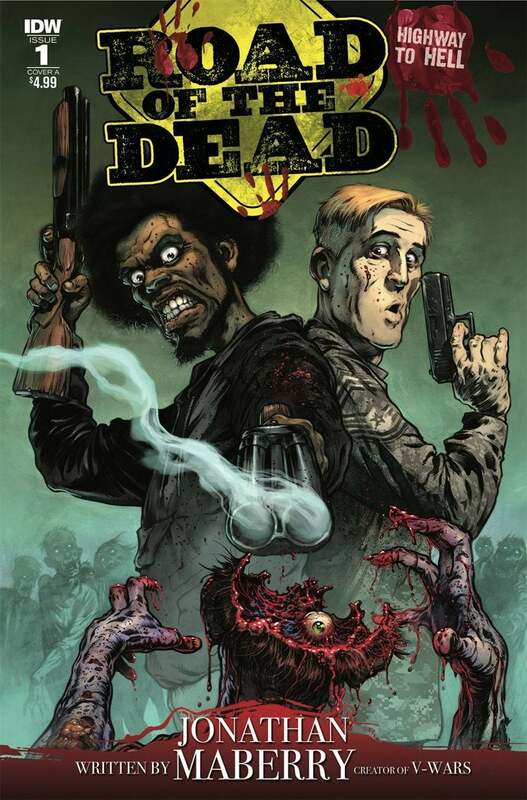 IDW describes the book, "An over-the-top wild ride prequel to Road of the Dead! Written by Jonathan Maberry, New York Times bestselling author and creator of V-WARS. The dead rose and are feasting on the living. A young scientist may hold the secret to a cure. Zombies and biker gangs want her dead. A bunch of losers in muscle cars and a hijacked tank will risk everything to save her." "I was ten years old when I snuck into a movie theater to see the world premiere of Night of the Living Dead," Maberry shared with SYFY WIRE about the project. "I've spent way too much of my life figuring out how I'd survive the zombie apocalypse -- which is something I confessed to George Romero on one of our long, rambling phone conversations while we were editing the Nights of the Living Dead anthology." Romero collaborated with Matt Birman, who is attached to direct the film, with the duo having written the script. The film was shopped at last year's Frontières only weeks before Romero passed away. "When the chance came up to dive back into that world for Road of the Dead: Highway To Hell, I jumped at it," Maberry revealed. "I mean, how could I not? This is a bunch of misfit heroes in an Abrams tank against biker gangs, unregulated militia, monster trucks, and zombie hordes. I have an absurd amount of fun with this." Road of the Dead is only one project the prolific filmmaker left behind, with his wife Suzanne Desrocher-Romero confirming earlier this year that there are dozens of his scripts that could be developed into future projects. "That's in the works I think. I think it's sputtered a little bit, but we'll see what happens," Desrocher confirmed with ComicBook.com about Road of the Dead. "But we have a lot. George was a prolific writer. He loved to write, and we have 40, 50 scripts that he's written, and a lot of it is very good. He had a lot to say, and he still does, because I'm gonna make sure that he does. It's my mission." Road of the Dead: Highway to Hell hits shelves on November 7th. Will you be picking up this series? Let us know in the comments below or hit up @TheWolfman on Twitter to talk all things horror and Star Wars!